So I’ve decided to make it my mission to try as many food trucks this summer as possible. 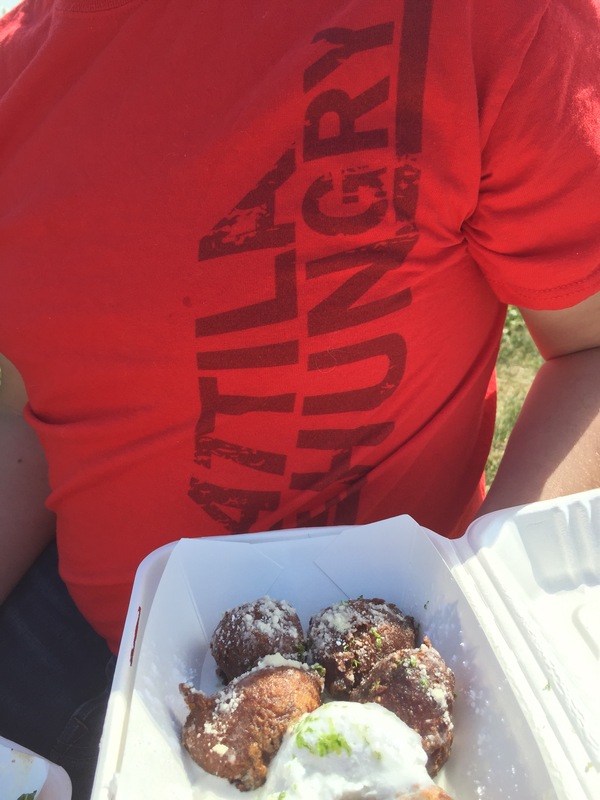 I’m as surprised as you are that I hadn’t gotten a chance to try Attila the HUNgry last year. And after the chef vs chef popups at the Pourhouse I was going to make sure that Atilla the HUNgry was going to be on my list of must tries. I’ve had a chance to track them down a few times now and so far everything I’ve had has been very tasty. I think this might be the dish they are best known for. 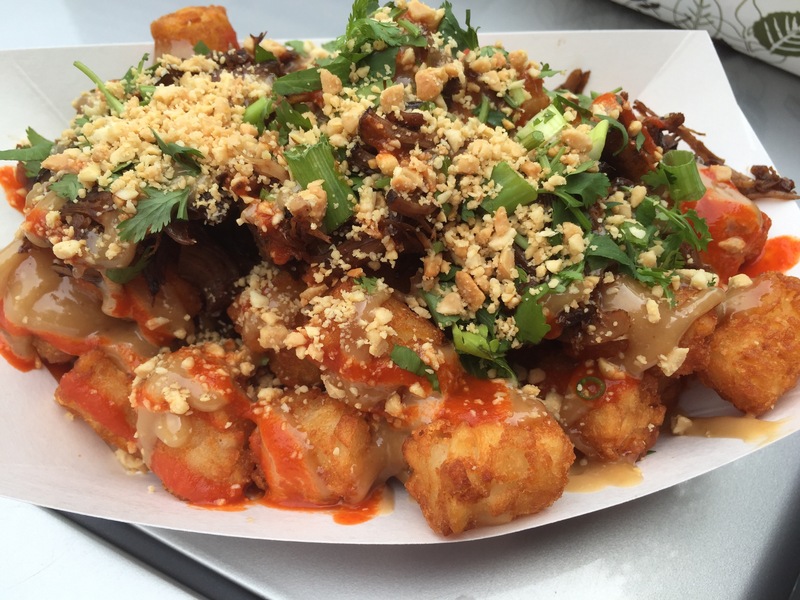 Thai braised duck piled on a mountain of crispy tater tots, topped with hoisin aioli and lime sriracha sauces then sprinkled with peanuts and herbs. 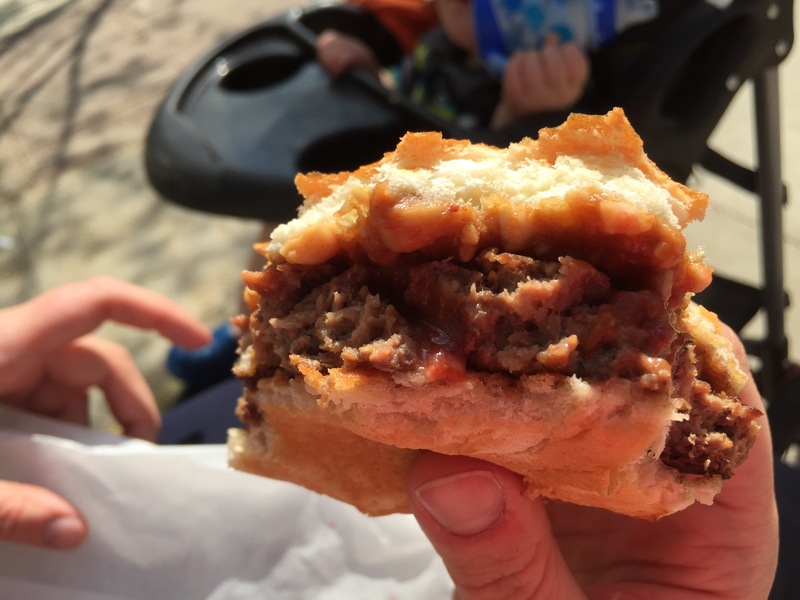 A handmade patty, Thai peanut butter, strawberry sriracha jam, peanuts on a brioche bun. This is an interesting blend of flavours. I’m not sure how the peanut butter is Thai, to me it just tasted like peanut butter, but that isn’t a bad thing. It goes well with the strawberry sriracha which is an even balance of both the strawberries and chili sauce. 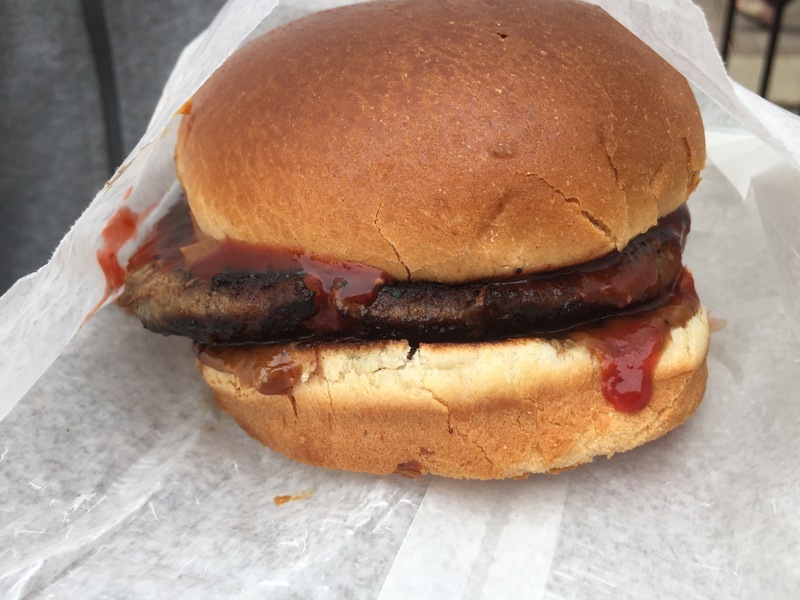 I appreciated that they didn’t bother to mess around with veggies on this burger since they would have just been lost in the striking flavours. Though the flavours are nothing I would have thought to combine on my own I think this one is a must try. A great summer salad. 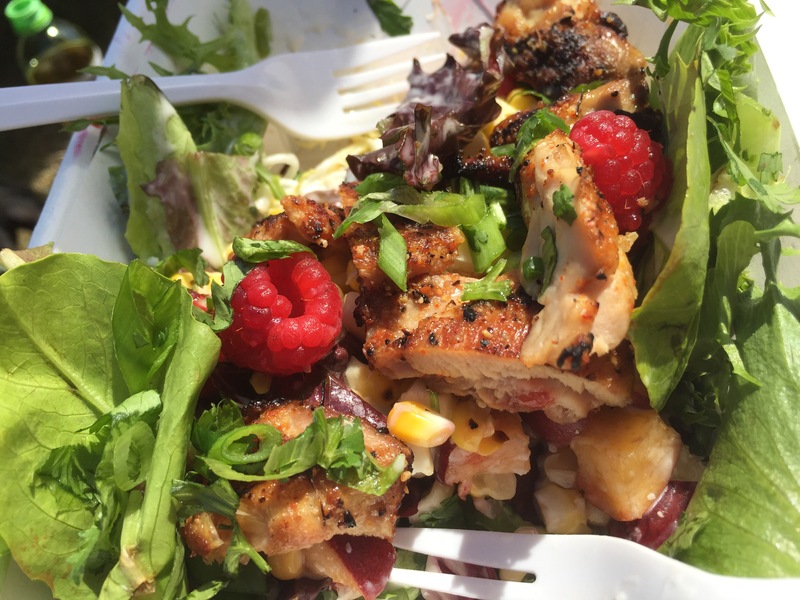 I would normally not think of ordering a salad from a food truck but I was feeling healthy that day 😉 And so glad I did. This was light and refreshing but hit the spot and still filled me up. Yum yum! I would love to buy a bottle of that dressing! 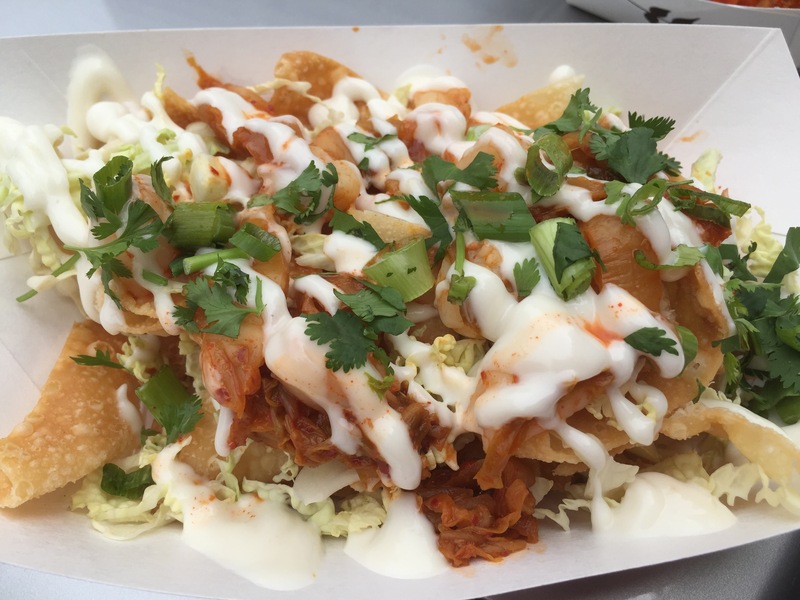 House made kimchi, shrimp, cabbage, garlic sesame aioli and herbs loaded on top of crispy wonton “chips”. This dish is my personal favorite! The chips are seasoned with something I can’t quite put my finger on, it’s a mix of spicy and sweet. The shrimp are perfectly cooked and cut into smaller pieces so you can easily scoop them with the chips. The house made kimchi I was a little worried about. I’ve tried kimchi before and it’s been way to hot for me but this kimchi is spot on! A little heat at the back of your mouth but not too much which means your still diving into this dish bite after delicious bite! 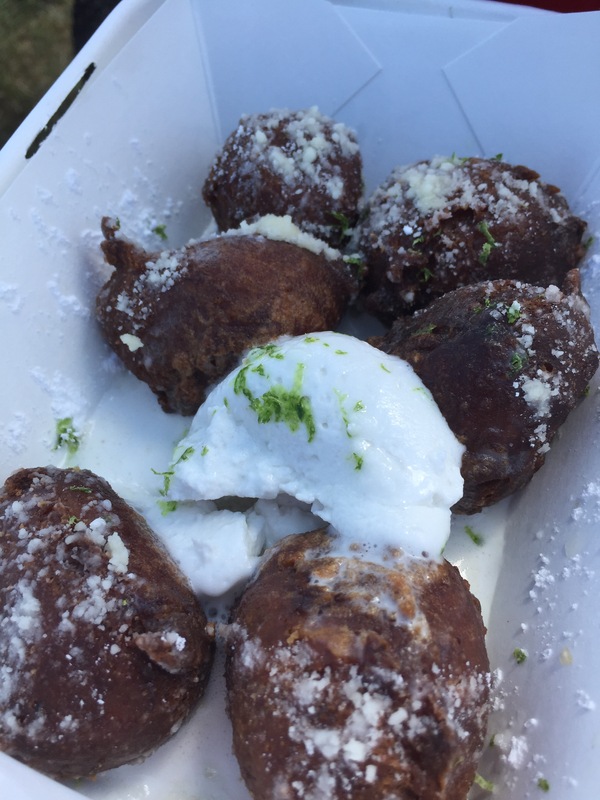 These are topped with coconut foam, lime juice, lime zest and icing sugar. Well I hope you will all take advantage of the beautiful summer we are having so far and go hit up some street eats. You will be pleased at what you can find and you’ll be supporting local small businesses which is always tops in my books. 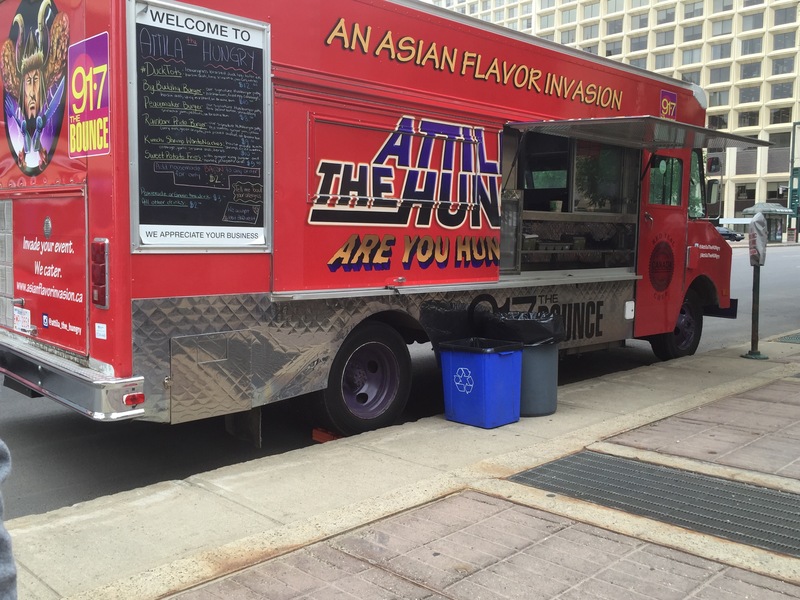 To find where Attila the HUNgry will be or many of the other food trucks down load the Street Food app or check out the street food website.